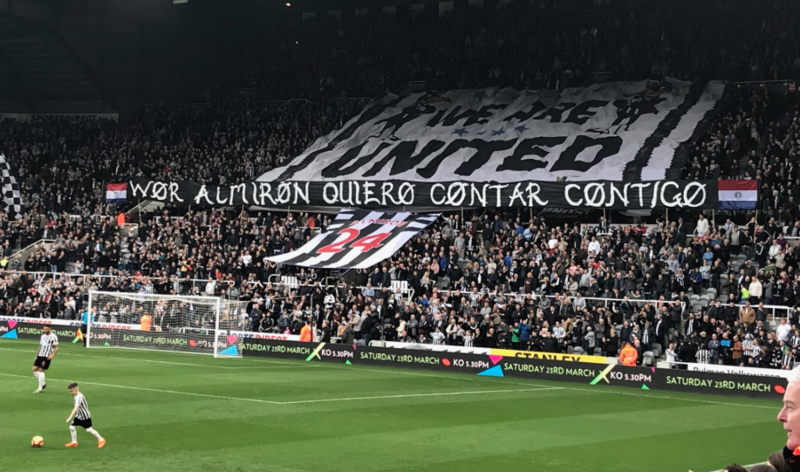 Newcastle 2-0 Huddersfield: Almiron shines in huge win at St James’ Park – NUFC blog – Newcastle United blog – NUFC Fixtures, News and Forum. Another monumental moment in our season today, with us making it three home league wins on the spin at St James’ Park – and what a debut it was from Miguel Almiron! An early Huddersfield red card just 20 minutes in may have turned the tide and given us a good 70 minutes to break down a toothless Huddersfield side, but that can’t take away from how convincing we were today in all areas. It’s a win that moves us 4 points clear of the relegation zone and yet another performance that suggests we will have more than enough to stay up this season, with several players impressing all over the pitch. Where to start with Almiron. He may not have scored or assisted, but he was absolutely everywhere. He created more chances than any other player has for us this season, his decision making was impressive, his movement outstanding and his final ball bang on more often than not. There’s few players who have both guile and pace, but he looks to have both in abundance – with his home debut performance fully justifying the brilliant display set up in the Gallowgate by Wor Flags. Elsewhere, Longstaff was absolutely outstanding once again and probably our man of the match…once again! He made it look easy at times, barely put a foot wrong and continues to play with a maturity and class beyond his years. Lejeune was impressive from the back – spraying balls left, right and centre, Rondon was a handful and thoroughly deserved his goal, Perez thrived in an attack that looked far more fluid with Almiron in it, Ritchie was a menace down our left and Dubravka was solid as a rock – dealing with crosses a weak-minded goalkeeper wouldn’t have even come for after two big mistakes. Elsewhere, Cardiff and Fulham both lost on Friday night as you may have seen, but Burnley managed a shock win over Spurs, with Southampton facing a trip to Arsenal tomorrow. Next up we have another big home game in the shape of Burnley – a match that could see us pull clear of the bottom three if we can come out on top again. A huge result and a hugely impressive debut from Miguel Almiron! Brighton are getting pulled into this mess of a relegation fight. 4 losses and a draw in the last 5 games. God that makes me feel old!!!! He was born in 1997 🙂 I think my cat was born in 1997!!!!! Eric I agree Hayden ok but nothing more than that. Longstaff outshines him by a mile. Almiron deserved a hat trick today. Any doubts that he wouldn’t be strong enough for the Premiership can be forgotten. I can’t tell if Mr. Roy (Hodgson) looks more like some sort of angry parakeet or a squirrel that missed its lunch at the moment. What the hell is Stuart doing in India anyway? Watching NUFC and having curry? What time is it there? 1. That The Beatles were actually quite good. 2. That despite what Lee Ryder said Miguel Almiron is actually a NUFC player now. 3. That Brexit is not really a good idea. 4. Is that 5 yet? I did actually learn something from Chris “the intern” Waugh. That the last red card from an opponent against NUFC was January 2014. So that is 4 and a half things I learned (learnt). Ritchie had a good game today and as usual worked his socks off. I think he needs to be aware more of Almiron’s movement. Great win, Longstaff motm, are commentators really only just noticing how much he’s like Carrick ! Good debut for Almiron too, lad deserved a goal or two really. Lejeune’s passing was awesome today, involved in both goals. One of the US commentators said Spurs would be able to afford more players next year because the new stadium (spaceship) would be paid for. Erm… it is costing more than 1 billion pounds. You will need several cheeserooms for a decade and have gone to the Chris “the intern” Waugh School of Economics to make that maths work. Or sell Dele Alli, Christian Eriksen and Sir Harrold of Kane, MBE to Real Madrid. I thought Yedlin had a good game today as well. He’s a pretty good fullback as long as you don’t ask him to defend. Lejeune and Schar Making Lascelles Great Again (MLGA). I am going to buy the red baseball cap. With you on the Yeddy bit . Eric I’m with you there on the Martinez link. The two of them together were dynamite for AU. Fantastic pace and about 50 goals between them. Great debut from Almiron. I had slight doubts about the PL pace and toughness but he’s as fit as a butcher’s dog and tough as they come. So pleased as he’s just what I (and Eric) predicted. I worry that they will put an agreement in place that he joins them next season. They are a good choice for him in that they have a team packed with pace and a good owner who backs managers. Oh and Vardy has expressed a desire to play under Rafa too. georgio: I have to admit that I don’t watch much MLS but was watching a few months ago to see how Rooney would do. That’s when I saw Almiron and he was so much better than everybody else. As you say, you can never really predict how someone will do in another league. Remember Shevchenko at Chelsea? I think we have a star there to go with Lejeune and Dubravka who I think are our best players. Guardian are saying Leicester want Rodgers. I am going to make a Man U/Liverpool prediction: Ashley Young to be sent off. Rafa gets a lot of stick sometimes over recruitment but think about this. Lejeune, Almiron, Dubravka, Schar and Longstaff for less than £35m. I’m impressed by them all. Schar for £3m and Fernandez for £6m. Unbelievable. See Longstaff’s waiting for a call up into England’s U21s. The way he’s played lately it should be the full team not the U21s! It is really strange to see the Man U fans be happy with just a point at home. Leicester are 12th – they are not a top 6 side. Put their league win to one side coz that was a freak season – they are not a top 6 side. So looking outside of that, Wolves and Watford are 7th and 8th – rightly so coz they have been very good this season. So the best Leicester could realistically be would be 9th – they are only 4pts away from that – and have been unlucky in a few games that I’ve seen them in. They have old players and young players and Puel was trying to transition through that, which will take time and patience – and this season was a good one to do that in coz they aren’t going down, so develop young players ready for next season. I don’t know how many managers that is now, but if that is a club that Rafa wants to go to, good luck to him – but have an average run (not even a bad run) and you are faced with the threat of the sack – coz Puel has been faced with it most of the season. As for NUFC yesterday – that was great to watch and I hope that lifts our home form going forward. Longstaff was MOTM and Almiron was brilliant along with Lejeune as many have mentioned. But I thought Ronnie had a great game and a stand out performance was Perez. I think playing alongside Almiron lifted him, gave him time and space he hasn’t been getting with Kenedy and Atsu. I’ve always rated Perez. His talent is not in question, it’s his consistency I think let’s him down – but I hope Almiron being in the team will benefit him. What’s this $hite about us shelling out £50m on a forward from Germany??? Exactly that, ****e mate, unless we been sold. I have always been a fan of Shelvey but Florian was hitting the Jonjo balls yesterday and doesn’t have the chronic lack of pace a brain farts. He was hitting 50 yard passes onto a sixpence. Thought Manure v Pool was a proper let down tbh. Sharpy: Perez always looked better with Dwight in the side. I think he needs players to take the focus off him and then his little flicks and dinks will come off. I reckon we are OK now. As a 50 year NUFC fan I am trying not to jinx us but I really believe we are almost over the line now, as Arrogant Alan would say. Haven’t seen many mentioning BFS for the Leicester job 🙂 Or Pards or Ugly John. I think they were all blinded by Klopp’s veneers on his teeth. What is it with Liverpool managers and the veneers? Brendan got them as well. Can you believe they actually appointed BFS (Sam Allardyce ) as England manager FFS? Or Steve. Or Mr. Roy? It beggars belief and we all knew how it would end – Fcking badly. Gareth has got some good players now. He might not fail as dismally. Haven’t seen many mentioning BFS for the Leicester job Or Pards or Ugly John. Eric – I think 1-11 we are ok, but squad wise we are still short of 4-5 players. I’m not really happy with the keepers behind Dubravka. I like Ritchie at LWB but don’t know about cover there – Dummett isn’t a wing back, I don’t rate Manquillo and too early for the new lad yet. I’m encouraged by Sterry behind Yedlin on the other side. I’m happy with the centre back and centre midfield options, but wingers and centre forwards we are still lacking badly imo. Sharpy17: Eric – I think 1-11 we are ok, but squad wise we are still short of 4-5 players. I’m not really happy with the keepers behind Dubravka.I like Ritchie at LWB but don’t know about cover there – Dummett isn’t a wing back, I don’t rate Manquillo and too early for the new lad yet.I’m encouraged by Sterry behind Yedlin on the other side. Hard to argue with you there mate. I still rate Dummett and wouldn’t discard him. I almost forgot that Joselu ended up coming on yesterday. If the Spanish donkey is anywhere near the side then it shows we still need improvement. Why does Rafa persist with him? Eric Sykes: Hard to argue with you there mate. I still rate Dummett and wouldn’t discard him. Eric – certainly not discarding Dummett, he’s my cult hero mate. I would have him as a CB option or a LB in a back 4 – it’s just as LWB I wouldn’t really use him coz I don’t think he’s got the offensive abilities as much. Apparently Aaron’s was excellent for Shef Wed yesterday – could he still be an option at LWB?. Probably not coz I think Rafa is done with him. Murphy seems to have started his loan at WBA well as well, and Gayle has bagged them a load of goals. Hopefully one of those 2 could be used as leverage in a Rondon deal. Prem – I’d never heard of him before this morning mate. I’m sure it’s a load of rubbish – or I hope so, coz if Rafa was handed £50m (unlikely) I could think of far better ways to spend it. I had never heard of Muto either until we signed him. Or Ginola (That’s not true, I just didn’t know we were even in the running for Kimtoon’s fave). I had never heard of SuperMac before we signed him. Saint Peter of Beardsley was signed from the Vancouver Whitecaps. Atlanta didn’t even have a football (soccer) team until 2 years ago and we went and paid a record fee for Almiron from them. … And Donald Trump is President and Teresa May is stumbling along into Brexit hellfire. Or the WGP (World’s Greatest Peruvian), Nobby Solano. I am discounting Paddington Bear because he is a fictional character. Eric – i think you’ve nearly made you’re point 😂. Sharpy: I wasn’t trying to make a point to you. Really, I wasn’t! You got me thinking about whether I had heard of a lot of the good players we had signed. We should have got Foden on loan though. He is the next superstar. Eric – I hadn’t heard of the likes of Kante and Mahrez before Leicester bought them for peanuts. I don’t mind that – unknowns for little money – we’ve had afew of those with the likes of Tiote and Cabaye. I actually thought Carr was very good at sniffing those players out overall. But £50m has to buy quality rather than unknowns like – not that it matters coz we won’t be buying the lad anyway 😂. Eric – I agree mate, and I’m also a big fan of Hudson-Odoi. But what I love at the moment is that the pundits are crowing about Longstaff as much as any young player in the top 6 clubs – rightly so of course. But it doesn’t often happen unless they play for Lpool, City, Chelsea, ManU or Spurs. 1. Think that they are doing well enough to be promoted. 2. But Hendo has fcked himself with Klopp. I think he will be given 3 games on the bench and then disappear. You do not disrespect a manager in the way he did and survive. (unless you are a truly great player like Dalgleish or Gerrard). Talking of disrespect , that Chelsea keeper Kepa certainly pi ssed off Sarri yesterday. Don’t think i have ever seen anything like that before. I missed that with Henderson/Klopp, what happened? Not necessarily fatal, but will be punished. The players I mentioned above – Lejeune, Almiron, Dubravka, Schar and Longstaff. What would they be worth if a big club like ManU came in for them? The way foreign clubs are valuing English youngsters like Hudson-Odoi at £38m who has only played a couple of games, then what would Longstaff be worth? Are Winks or Dier for England any better than Sean? Rafa says Muto has “trained well”. That is Rafa code for he will be in the squad and get the last 20 minutes against Burnley. Bad news for the Spanish Donkey. I don’t normally criticize NUFC players but there are exceptions when they are obviously so bad – Amdy Faye and Joselu. Andy the Magpie. You obviously have never watched Almiron play in MLS if you say he doesn’t track back. Have you and Dennis Wise been sitting down together and basing all of your comments/knowledge of a player on a 4 minute YouTube clip? I mean. If you had watched 4 minutes of Beardsley on youtube you would have never seen the great work he did tracking back. BECAUSE they show the goals and great bits of skill before they show the sliding tackles to retrieve the ball. Lee “the idiot” Ryder, Chris “the intern” Waugh and Mark “the apologist” Douglas (all he does now is apologize for what The Chronic write) said Almiron was lightweight and it was repeated by them so often that it was assumed to be fact. THEY HAD NEVER WATCHED HIM. They never do any research and are incompetent. I wouldn’t trust any of them to make me a cup of tea, never mind decide on who is a good football player. Finally a convincing win – two clear goals! Finally a red card for the opposition! If I read the Chron right then it has been FIVE years since someone was last sent off against us in the league, while we’ve had 18 sent off in that time…madness. Let’s just hope one of the bigger team’s hatchet men don’t get away with seriously injuring Almiron because with the role he is playing and the pace he is getting up to he will be at risk. Burnley will be tougher than they were the last time we played them, but if we can get another solid win then confidence will be high and survival should be more or less guaranteed. Everyone did well, but we need a serious upgrade on Yedlin. Considering the amount of ball he gets and the positions he is able to get into because of his speed, the rest of his game is really pretty woeful. I know I am very boring about how bad The Chronic “reporters” are at their jobs. But, seriously. I think Ryder has been there for like 20 years and is totally useless. They have that “Everything is Black and White” podcast and I have never watched a single minute of it. Because I know I would pick up my computer and throw it against the wall. They are that bad! How many Chronicle reporters does it take to change a lightbulb? Who the fck knows? They were all on free trips to Alicante drinking sangria. Almiron just has to watch the heavy challenges coming. That was a real leg breaker on Sat. Deserved two red cards.